Monday I left Oslo and travelled north on business. As I travelled out of Oslo it is so apparent the winter is approaching. I visited my friends Stian Sagerud and Øyvind Lodten at Hamar, the city by the lake. 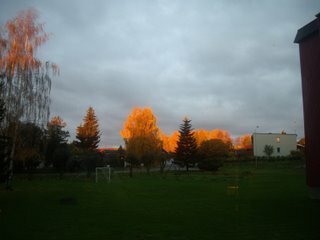 There I took this picture - the morning sun rising october 25th. It is a distinctly automnal feeling here, as the birch-trees turn yellow, and it is a touch of frost in the air. These are times for rich hardy meals and a good drink. As we approach christmas certain seasonal dishes turn up. These are often accompagnied by beer and the ultimate winter drink - the Akevitt. I tend to compare some Norwegian dishes to martial art. This is particularly the case when you enjoy a plate of Lutefisk (dried cod treated with lye). The fact that you use lye in food make people wonder whether you've got you marbles intact. When my mother made lutefisk you sometimes did not believe you own nose. Another speciality is is Smalahoved (salted and smoked sheep heads), this is a recipe that you either hate or love. Personally I've been there, done that, once. Poking in the eye of the poor animal (considered a delicacy) is an experience you never forget. Well - after telling you this, I beg you - do not consider us barbarians! There are so much good to eat during the autumn. Today I had dinner at Dovrehallen, founded around 1900, and there I could admire the view of salted and steamed meat with mashed turnip. My friends could not eat the fat. But I remind myself that since we turned so civilized we tend to forget that hard working people needed all the fat they could get as winter was coming. I chose ground meat cakes with potatoes, steamed vegetables, gravy and lingonberry jam. My friends then said - we should have had some Akevitt to this, but we chose not. Yesterday arriving in Hamar I ate wonderful homemade spaghetti bolognaise with red wine. Stian and Øyvind served a wonderful bottle of Ripasso from Italy, smooth and spicy, with taste of red berries. And what did they serve as we finished this bottle and another one - two glasses of Akevitt. A stronge alcoholic beverage (40 percent alcohol), made from potatoes and spices, it is the trademark of Scandinavia. Sweden, Denmark and Norway fight to be the prime producers of this water of life (Aqua Vita). Yesterday they presented me with both Løitens Linie and Løitens Export. As the taste of this spicy yellow drink spreads in your mouth you find there is nothing else to drink in autumn. The Løiten Akevitt is produced in different varieties at Løten, close to Hamar. The Linie gets its name during the maturity process that take place on a cargo ship that cross the Line, the Equator, twice before it is sold. Personally I love the most expensive one, the Gilde Non Plus Ultra, that rivals the best brandy. To be enjoyed in front of the fire, smooth and seductive. I have not mentioned all that is good to eat during during autumn. For those of you that would like to try - here are some rich Norwegian dishes for the cold dark season.